*Recommended retail price, following 01/08/2018 pricelist, excluding transport and other costs. This price is subject to French VAT and is likely to change depending on the country of purchase. The surprisingly spacious Flyer 8 SPACEdeck is a joy to drive and to live aboard. Certified to carry 10 passengers, she is ideal for all day-boating programmes: bathing, picnicking on board, water sports or fishing trips. 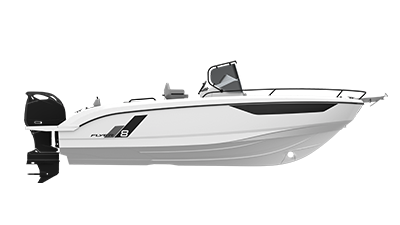 The style of the Flyer 8 SPACEdeck is boldly modern, with energetic lines, black pulpits and an optimized beam. 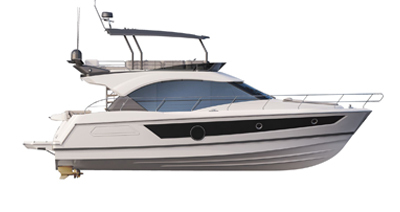 Driving is sheer pleasure, with good sea-keeping performance, thanks to an Air Step 2-equipped hull. This Flyer boasts excellent modularity with a central console, modular cockpit and an aft bench that folds back to convert to a sun lounger. The woodwork and upholstery come in a choice of two colours and are of high-quality, as is the overall finish, showing true attention to detail. Functional, ergonomic and agile, every space on the Flyer 8 SPACEdeck is optimized and there is a wide range of options to suit the largest of families! The Flyer 8 SPACEdeck is small enough and easy to transport by road. The Flyer 8 SPACEdeck’s single engine is ergonomic, saves money and offers good performance. Circulation to the stern is made easier and the swim platform is much bigger. With a 350 hp Suzuki engine, she can reach peak speeds of 43 knots. With a fishing station or T-top, the Flyer 8 SPACEdeck can be used for any programme.